Yeah, Superman may be the Man of Steel, but my hero is FlyLady, the Woman of Steel Wool. When I was a child, housecleaning was not part of the curriculum. I would spend hours staring at the mess in my bedroom, wondering how other people did it. Eventually I'd just shove everything under my bed and into the closet, and call it good. Is it any wonder, then, that I grew up to be an Adult Who Doesn't Know How to Clean Anything? Or that some of my children grew up just as poorly educated? 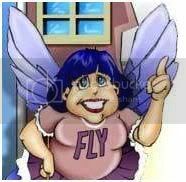 But it's never too late to learn; FlyLady has rescued me from the second half of a lifetime badly lived. Now my sinks are shiny and my toilets are scrubbed. It's a start. We're tackling clutter, one room at a time. Are you Born Organized? If so, please share your best housekeeping tip by clicking that Comments link below.